There is nothing like a fresh homemade tempeh recipe to make you realize what you've been missing! 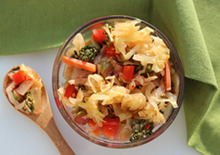 Frozen store-bought varieties available in many health food markets largely pale in comparison to the wonderful savory flavors of this traditional Javanese food. 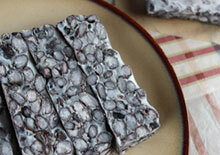 The rich "mushroomy" taste of the homemade "tempe" is really the only tempeh worth eating. In fact, it is often so good that you don't even need to prepare it with sauces or marinades. 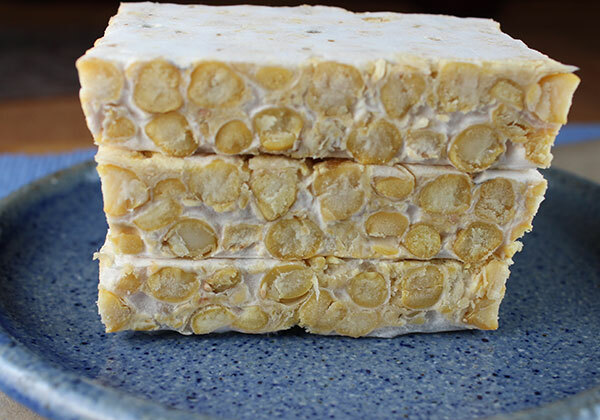 Although soybeans are traditionally used to make Indonesian-style tempeh, the best part about making it yourself is that you get to use any bean you want, not just soybean. 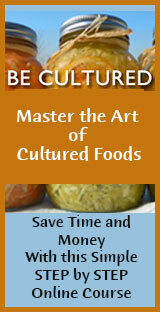 Over time, you will discover your favorite legumes and combination's. Our all-time favorite beans to use are black bean, pinto, black-eyed pea, mung bean, red beans and garbanzo. But, you can also add cooked grains, like millet and wild rice, as well as a variety of spices, nuts, seeds and seaweeds. Indonesian tempehs traditionally use peanut, millet and coconut along with soybean, but did you know that you can even make bean-less tempeh using grains only? 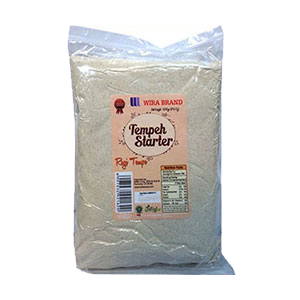 Tempeh starter spores will inoculate just about any starch as well as protein source. Just like making other fermented foods, like sauerkraut, miso or kefir, making tempeh at home is a very satisfying experience. Although your first batch might seem somewhat like a scientific experiment, once you get down the basic process you will never want to eat beans any other way. 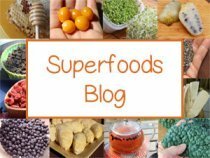 The tempeh culture essentially creates a pre-digested food that helps to break down proteins as well as some of the "anti-nutrients" found in legumes that are notorious for causing digestive upset and flatulence-producing side-effects. 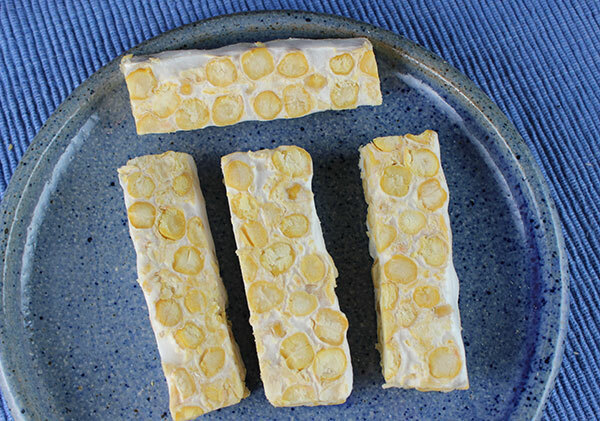 For many people who can't normally digest beans, a homemade tempeh recipe is the perfect solution. Making tempeh from scratch is very easy and is made with only a few ingredients. The hardest part comes when it's time to incubate it. 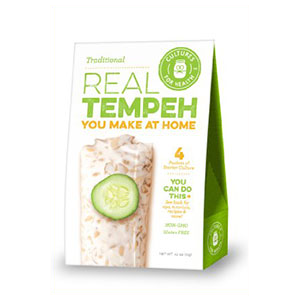 Tempeh needs to ferment at a consistent temperature that remains between 85-90°F (29-32°C), with 88°F (31°C) being ideal. 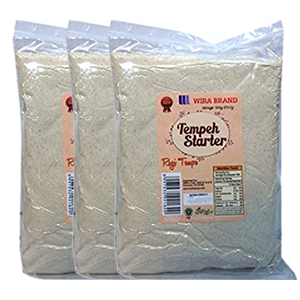 The powdered spore starter helps bind the beans into a sliceable solid block, about 1/2-3/4 of an inch thick, and the tempeh will take the form of whatever your fermenting it in. It is always necessary to make it in a vented container to allow for some air circulation. A plastic bag with forked holes is the most common method used by tempeh-makers. However, during the second half of the incubation period the batch tends to "sweat" and get very warm. The thing with plastic bags is that you may potentially get a lot of plastic leaching into the tempeh because of these conditions. This is why we prefer to use a harder plastic container rather than bags. We make our own special tempeh container by drilling holes in the base and cover to get plenty of air exposure. The best material for culturing would, of course, be glass instead of plastic. Sometimes it also works in a glass Pyrex dish or baking sheet covered with "forked or pin-holed" foil or plastic wrap on top. But, because there are no air holes on the bottom, this is not always a full-proof method. People like to use plastic bags because the tempeh easily molds into a congealed cake. 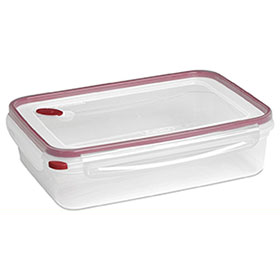 When using Tupperware, the mold will grow up on the top because there is a few inches of space between the tempeh and the lid with nothing pressing down on it. However, when flipped upside-down, this Rhizopus mold growth will flatten into the cake. 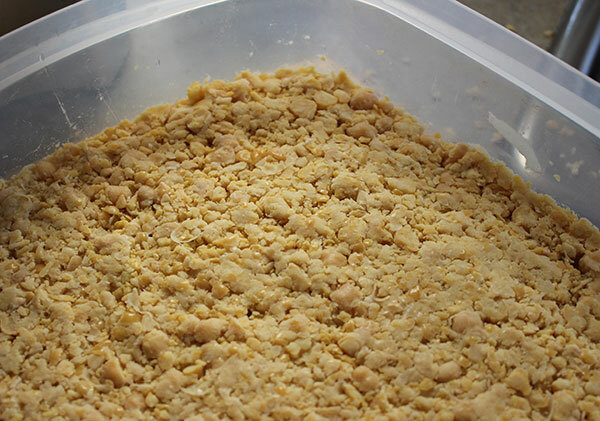 One of the most important things about making a homemade tempeh recipe is that the temperature needs to remain consistent at about 85-90°F (29-32°C), especially during the first half of the incubation process. 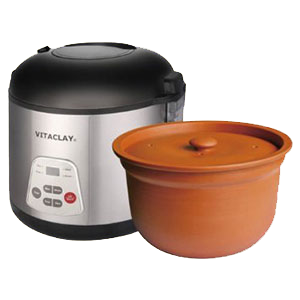 After about 12 hours it starts to generate its own heat, which will create condensation in whatever container you are using. It is therefore important to have appropriate ventilation to avoid too much moisture from inhibiting fermentation. In other words, tempeh requires some surrounding air flow, not too much or too little. In general, you don't want it to get too hot, too dry, too moist or too cold. Using a thermometer is preferred so that you can regulate heat and make sure it is within a suitable temperature range. 1) Dehydrator - We commonly use our Excalibur dehydrator as an incubation chamber. With the dehydrator turned off, you simply place the container or bag on top of a screened tray closer to the top with a heating pad on the bottom. 2) Oven - This can be achieved by using an oven on the lowest temperature setting with a mason jar lid in the door to crack it open slightly, so there is air flow and not too much heat. 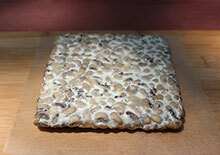 3) Cabinet - Tempeh can be incubated in a high cracked-open cabinet space elevated over a heat source, like a heating pad. 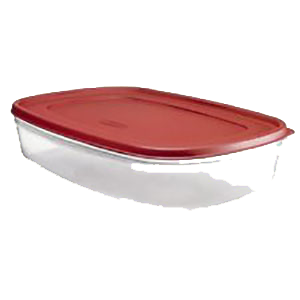 4) Medium Size Storage Tote - You can use a plastic storage tote with a lid by placing a heating pad on the bottom with a dish underneath to elevate it. 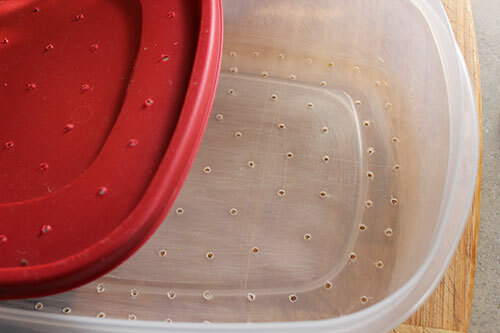 For this method, there should be holes in the tote to prevent the build-up of moisture, or you can likewise leave the lid cracked open slightly. 5) Cooler or Icebox - Place in a medium size or large cooler with a heat source, making sure there is plenty of air space around it and leave the lid cracked open for ventilation. 6) Homemade Tempeh Making Incubator - Some tempeh-makers make their own incubators, specifically for making tempeh, using a variety of different methods. This usually involves a storage tote with tubing mechanisms to remove excess moisture as well as temperature controls. High quality Indonesian varieties are believed to offer a greater diversity of molds, yeast and bacteria. Once you have a good starter you can actually propagate more of your own starter culture by dehydrating thin slices of over-ripened tempeh (40-50 hours) and blending it into a powder. This procedure can be a be tricky however. 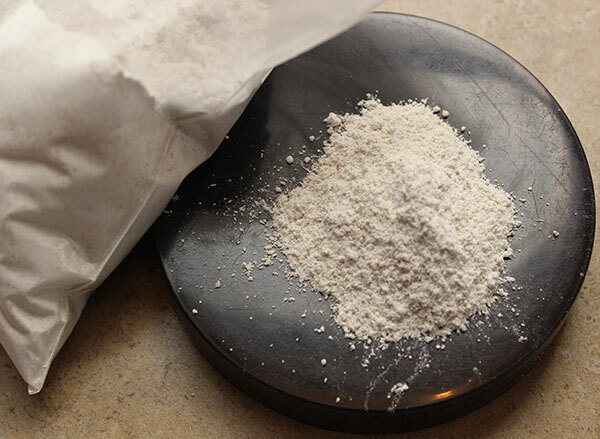 We tend to stick with using straight powders, rather than making our own. 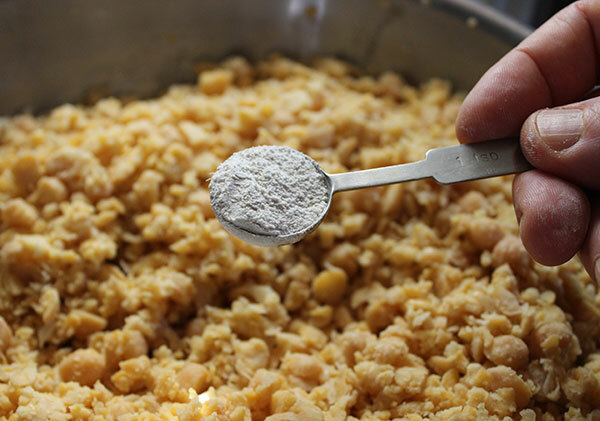 Dehulling the beans is a commonly adhered to practice when making a homemade tempeh recipe. This allows the spore culture to adequately predigest the beans. 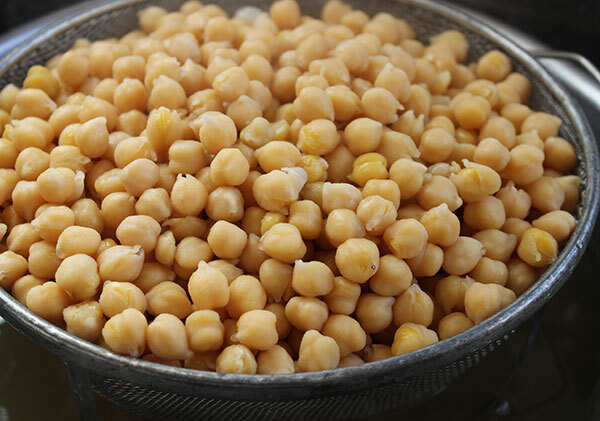 This can be achieved by soaking the legumes and briskly rubbing them to remove most of the hulls, which usually float to the top at this stage or after the cooking process. We have found that it is not completely necessary to remove all of the hulls. It is fine if some are remaining in your tempeh mix, they just add more fiber content and will not impede Rhizopus mold growth. 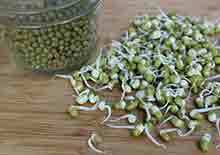 Slightly processing the cooked beans in a food processor can also eliminate the need for the dehulling procedure. 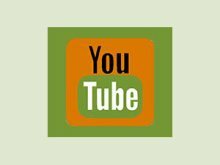 Some people feel that the more hulls that are removed the better tasting the tempeh, but we have not necessarily found this to be true from our personal experience. 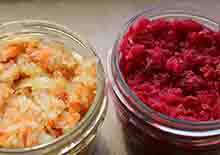 As with making any of the fermented foods, you need to make sure all equipment you are using is clean and sterile to avoid potential contamination. Soak beans overnight in pure, filtered non-chlorinated hot boiling water. The next day strain and rinse again, rubbing briskly to remove any loose hulls. Cook in water until soft but still firm (slightly underdone). Strain liquid and let cool to room temperature. Lay out the beans on a clean baking sheet and pat them dry with a clean towel. Place 1/8 of the beans in food processor and process slightly, or use a potato masher. In a large bowl mix the processed beans and whole beans together. Add vinegar and mix with spoon. Add tempeh starter and mix thoroughly. Press evenly into your chosen container or bag. 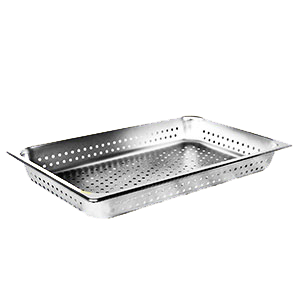 Place lid (with holes) on top of container or foil/wax paper (with fork holes) on top of dish or tray. When using a plastic bag, use a fork to puncture holes about 1 1/2-2 inches apart. 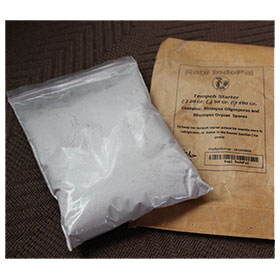 Set in incubation chamber for approximately 24-36 hours, between 85-90°F (29-32°C), or until white mycelium spores have thoroughly bound the beans into a firm cake-like texture. Some people prefer the flavor of tempeh that has sporulated slightly after a longer incubation period. This is evident by dark black patches near the hole marks. After this fermentation time, you will have a delicious homemade tempeh recipe you can now cut up into squares and wrap in wax paper. After the fermentation process, your tempeh should smell pleasant with a rich mushroom like fragrance. The tempeh should be firm and hold together when sliced. Again, a few black spots on your tempeh, especially where exposed to air, is not an indication that it has gone bad. All this means is that the culture has entered into its sporulation phase. Some black spotting is good and can increase flavor. 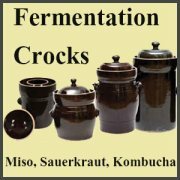 Your tempeh has gone bad if it is slimy, mushy or too wet or has only small broken-up patches of the white spore growth. It is pretty noticeable when this has occurred. If so, you must discard the batch and try again. Not too close to the heat source. Incubation temp is not too high or too low, using a thermometer to gauge. Beans are not too wet when the batch was created. Spore starter is not too old as it loses potency after 2 years. Not enough air flow or the heat was too high; creates patchy mold growth. The tender, nutty, rich mushroom-like flavor of tempeh is delicious with grains, in soups, salads or as a sandwich ingredient. It can be baked, lightly sautéed, steamed, baked or grilled as a meat alternative for vegans, vegetarians and likewise makes the perfect cooked food option for those wanting to reduce animal meat consumption. 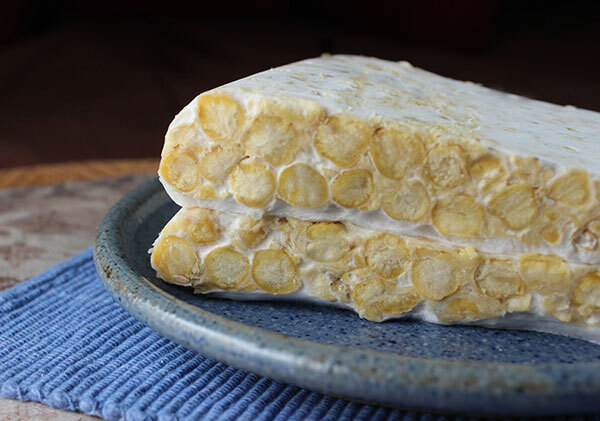 For healthy cooking tips or more specifics on cooking homemade or store-bought varieties, visit our page on the different ways to prepare tempeh. 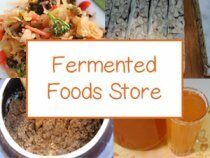 On our fermented food recipes page, we also list other top recipe ferments you might like to explore.